Welcome to the Open-Source Project HOPR! 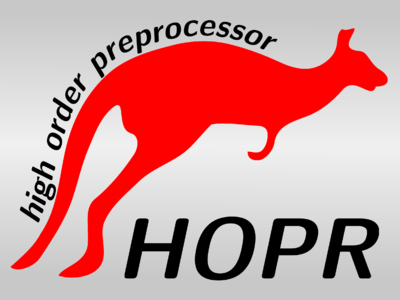 HOPR (High Order Preprocessor) is an open-source tool to generate three-dimensional unstructured high-order meshes. These meshes are required for high-order methods like Discontinuous Galerkin schemes, Spectral Element Methods or pFEM, if curved domain boundaries are present. As only few realistic , as it is the case for nearly industrial applications. In addition to its own in-built mesh generation capabilities, HOPR is capable of reading default linear meshes from a variety of different mesh formats and output high-order meshes at curved boundaries as well as in the whole volume. Several techniques to generate high-order meshes are available in HOPR, curved boundaries can for example be generated using normal vectors at the surfaces or by subdividing the surface mesh. Volume curved meshes can be generated by agglomerating block-structured meshes to curved hexahedral meshes, with support to partially uncurve the mesh away from boundaries. HOPR also supports subdivision of tetrahedral meshes into hexahedral meshes. HOPR inherently provides an effective domain partitioning, required for parallel applications, by sorting the output mesh along space-filling curves. This minimizes the implementation effort for solvers, as the mesh is already pre-partitioned on any number of cores and solvers can dispose of libraries required for domain partitioning. The output mesh file itself is based on HDF5, with an optimized layout for massively parallel access. Please have a look at the HOPR overview presentation and the documentation of the HOPR output mesh format. This page was last modified on 10 March 2016, at 12:31.